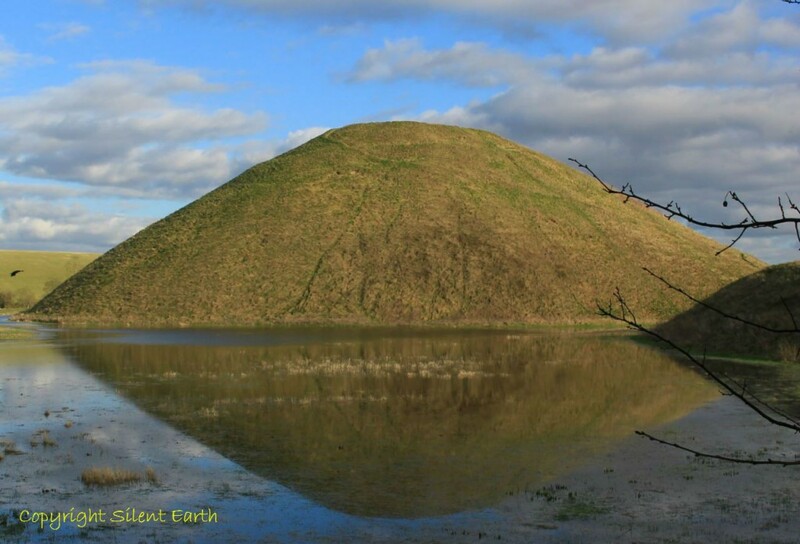 Silbury Hill near Avebury in Wiltshire was probably completed around 2400 BC and is situated at the source of the River Kennet, a major tributary of the River Thames. It is approximately 131 feet high and stands as a truncated cone close to the valley floor. It does not appear above the skyline of surrounding hills and although visually inconspicuous from a distance, its sheer bulk becomes apparent when approached. The bridle has subsequently been dated to the 11th century and the burial (if associated) is assumed by English Heritage to be of similar date. In 1776 Colonel Edward Drax used a team of miners from the Mendip hills in Somerset to excavate a vertical shaft from the top of the mound, but no clear records of this excavation exist. (Brian Edwards 2010 article published in Wiltshire Archaeological and Natural History Magazine ‘Silbury Hill Edward Drax and the 1776 excavations’ is here.) There is, however, a reference in 1793 by Revd. James Douglas in Nenia Brittannica stating ‘The only relic found at the bottom, and which Colonel Drax showed me, was a thin slip of Oakwood’. Drax wrote in letters in 1776 discovered by Brian Edwards in the British Library: ‘Still as we go down we continue finding pieces of deer horns of a very large size in all appearance either of large stags or else the moose deer.’ He wrote that these horns were found at 23, 28 and 30 feet from the summit. He also recounted in a second letter in 1776 (again discovered by Brian Edwards) his observations of an incident as the tunnel reached 95 feet from the summit, (approximately within 5 feet or so of the natural ground level): ‘We struck upon a thing which I am sanguine enough to hope will lead to a great discovery. It was a perpendicular cavity that as yet appears bottomless. It is just 6 inches over; we have followed it already about 20 feet; we can plumb it about eleven feet more but as a great deal of loose chalk has unfortunately fallen in, at that depth, is a stoppage but as at present a strong wind comes up the hole enough almost to blow out a candle, it must have some communication with the air or some great cavity somewhere. 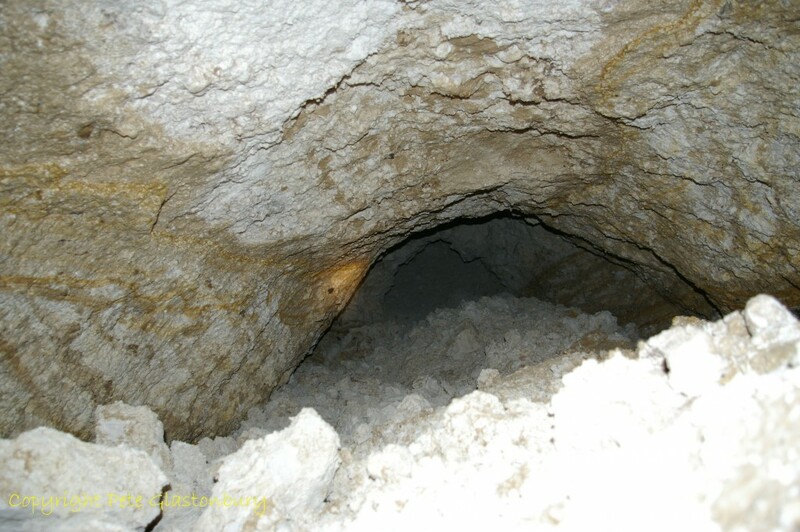 At first what the miners call a damp or foul air came out of it into the shaft so that they could hardly breathe nor would a candle burn, but that is over and now a strong wind comes up; as it is in the very centre of this great hill and goes perpendicular down, it is matter of astonishment. The country people when we were at work at the barrow said that on the hill opposite on the other side of the River Kennet, on a great Long Barrow (West Kennet Long Barrow) set round with stones, the people at work there to get the stone had discover’d a great hole which they always had an opinion had a communication under Silbury Hill’. The Central Committee of the Archaeological Institute arranged for an investigation of the mound in 1849. A tunnel was dug from the south of the mound below the original land surface. The Very Revd. John Merewether, Dean of Hereford Cathedral, recorded that the tunnel broke through the original land surface at a distance of 33 yards from the tunnel entrance. Here the mound was composed of ‘brownish aerh chalky rubble’ and this level was subsequently followed to the centre of the mound where ‘sods of turf and moss in layers appeared to be of the greatest thickness … curving layers of turf lying one over the other’ were found. ‘The turf was quite black, as was also the undecayed moss and grass which formed the surface of each layer, and amongst it were the dead shells etc’. The Reverend also recorded ‘many sarsen stones were discovered’ and suggested that they provided a kind of peristalith ( a ring of upright stones around a mound or dolmen). The only finds were fragments of antler and a few animal bones from the body of the mound. 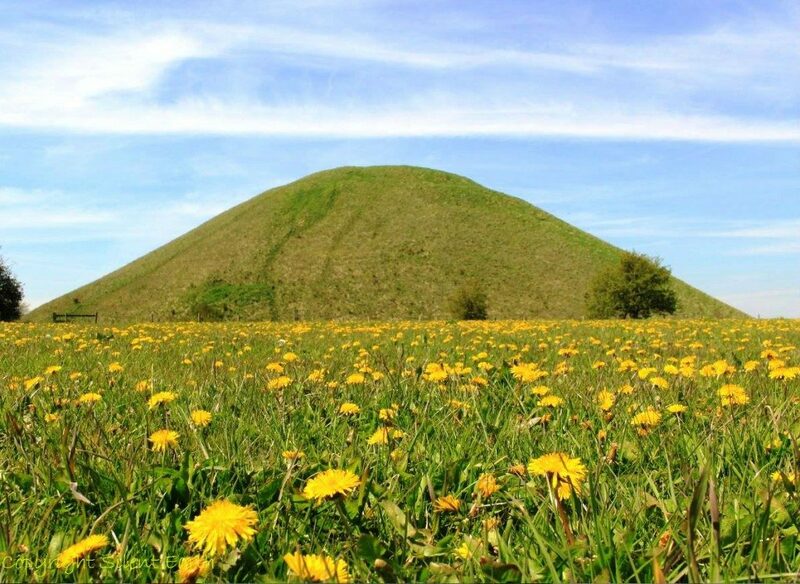 The mound was one of the first monuments in Britain to be protected under the Ancient Monuments Act 1882. The presence of sarsen within the mound is confirmed in recent work and was mentioned on three other occasions during excavations, by Merewether, Petrie and Atkinson. No sign of a sarsen peristalith is currently visible. At various points around the slopes are traces of horizontal terraces, platforms or breaks of slope. 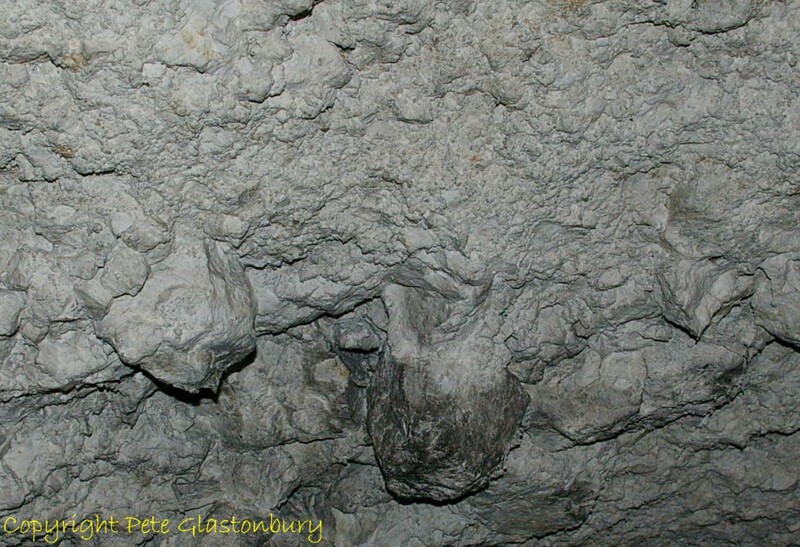 The uppermost of these ledges, a maximum of 2.5m wide on the surface, lies 4 metres below the summit. A second ledge or terrace can be traced at approximately 10 metres below the summit and stretches of breaks of slope that might account for others lie at 15, 19 and 27 metres below the summit. If perambulated, the upper ledge finishes the circuit at a position below the starting point and implies a spiral arrangement. Terracing could have formed a spiral ascent of the hill. A spiral would initially allow easy access and material could be relatively easily carried or dragged up to the working level. As a finished monument, a spiral arrangement would have provided a perfect processional way. If it is a spiral, it is arranged clockwise ‘sunwise’ from the top downward, and one would ascend anticlockwise ‘widdershins’. Other platform-like features are are situated around the mound, both on the slopes and close to the original ground level, which remain undated. In the west are two 2m wide sub-rectangular platforms that stretch for 12 metres which are of unknown purpose but could have held structures. The present pathway to the summit, eroded and hollowed in places, curves around the western slopes, starting opposite the southwestern causeway, and dates from at least 1663. There is an external ditch in the south and east, the sides are steeply cut compared to the north, where the outer edge of the visible ditch is quite shallow, resulting in a broad flat bottom up to 43 metres across. 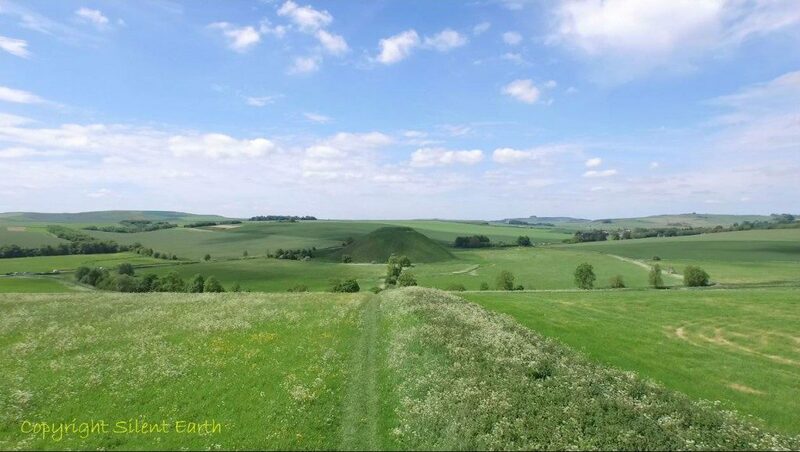 Below: A platform-like feature on the southwestern side of Silbury hill can be seen on the right-hand side, also referred to as a ‘spur’. Of the stone incorporated in the hill are four struck flakes of spotted dolerite (bluestone) recovered from the summit. All the fragments are from subsoil or topsoil, and a prehistoric origin for them has been suggested by English Heritage to ‘remain a possibility’. A piece of rhyolite was also recovered in the nineteenth century from a Roman well near the base of Silbury hill, which on analysis by Dr. Rob Ixer ‘is one that has not been recognised from either the extant orthostats or debitage from Stonehenge’. In respect of the four dolerite fragments from the summit, he concludes ‘Their petrography is the same as most of the Stonehenge orthostats and their size and shape are consistent with the smaller preselite debitage from Stonehenge’. Plant remains from the mound include dandelion, buttercup, stinging nettle, hazel, elder, thistle, sedge, wheat, barley, cereal, dock, willow, watercress, cabbage, brambles, sloe, crab apple, hawthorn, rose family, clover, forget-me-not, hemp nettle, ground ivy, meadow grass and a number of other grasses. Pollen counts from analysed samples include Scots pine, yew, elm, oak, birch, alder, hazel, lime, willow and ash. Animal bones relating to cattle, red deer, sheep, goat, badgers and moles were identified. More on Emmeline Fisher here. and here. Pete Glastonbury spent some time inside Silbury Hill during the excavations of 2007/2008 and has kindly allowed Silent Earth to share a small selection of his unique photographs during the visit below. 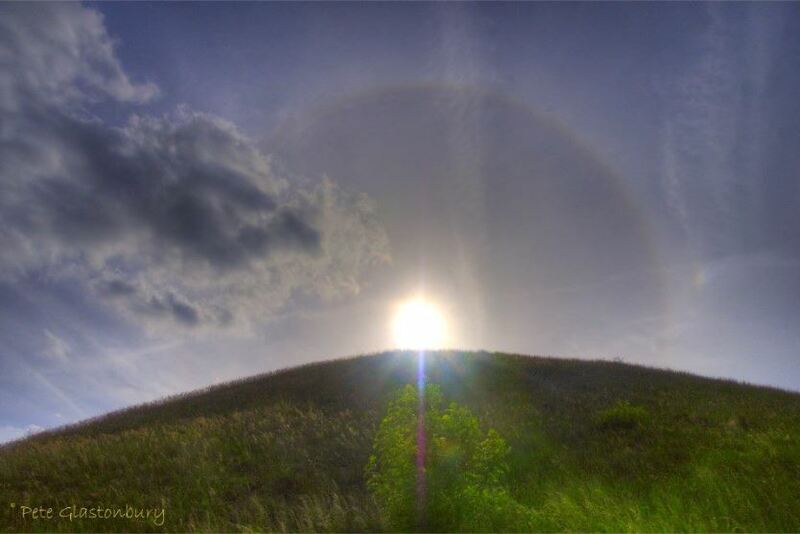 Thank you to English Heritage for the information here, largely sourced from its 2013 publication Silbury Hill: The Largest Prehistoric Mound in Europe and the contributors quoted in this article. 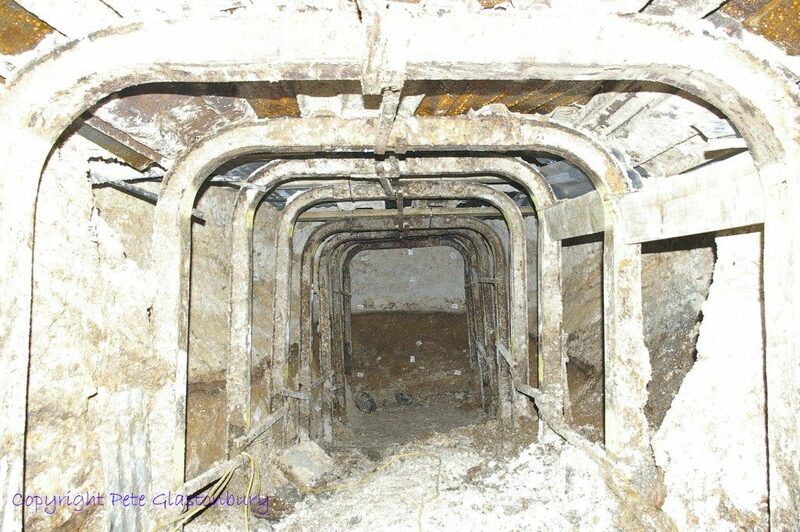 Thank you Pete Glastonbury for use of the photographs inside Silbury hill and Brian Edwards for the link to his 2010 article published in Wiltshire Archaeological and Natural History Magazine ‘Silbury Hill Edward Drax and the 1776 excavations’ here, ‘Stukeley’s bridle’ here. and A Missing Drawing and an Overlooked Text: Silbury Hill Archive Finds here. 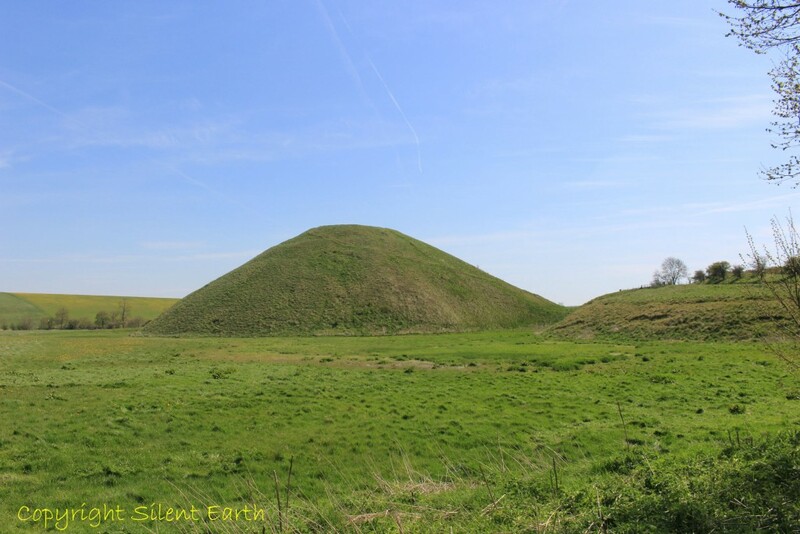 Silbury Hill Edward Drax and the 1776 excavations. 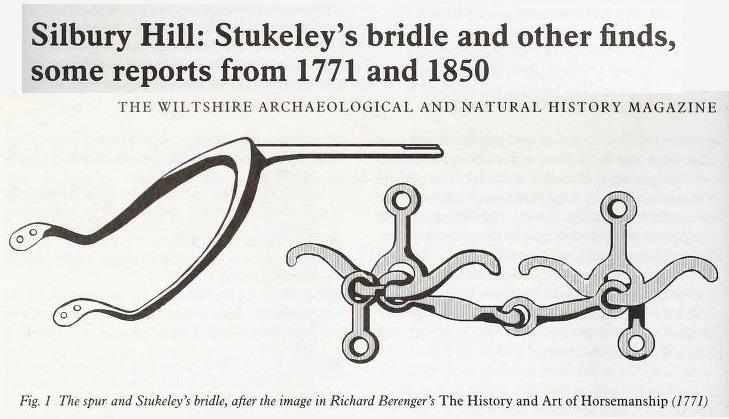 Brian Edwards article published in Wiltshire Archaeological and Natural History Magazine ‘Silbury Hill: Stukeley’s bridle and other finds , some reports from 1771 and 1850’ is here. 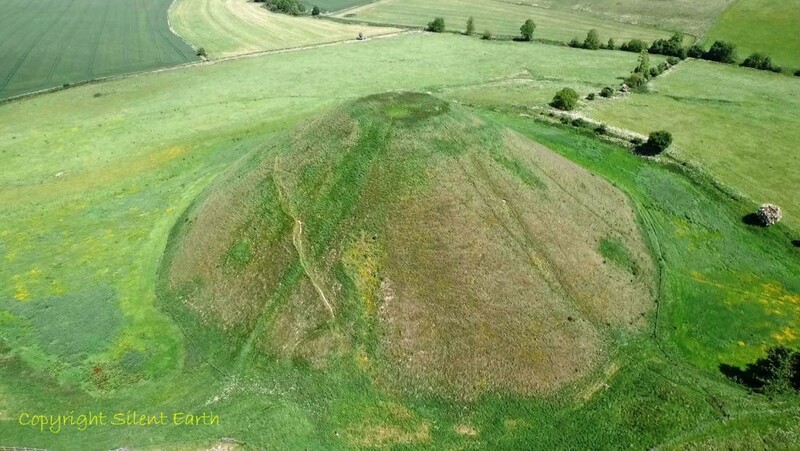 ‘A Missing Drawing and an Overlooked Text: Silbury Hill Archive Finds’ an article by Brian Edwards published in Wiltshire Archaeological and Natural History Magazine here.